chilled. 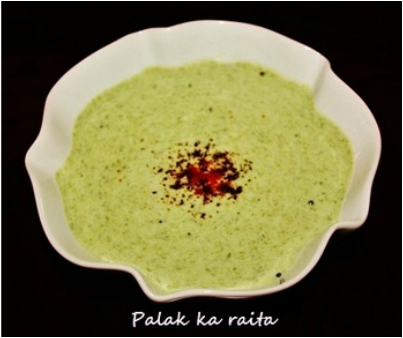 This raita goes well with spicy hot curies and with spicy layered paratha, lachha paratha. boil for 10 minutes or until spinach become soft. 2. Let the spinach cool down. 2. 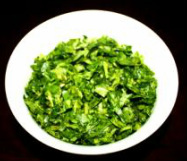 Transfer the boiled spinach in the blender and grind it. 3. In a bowl whisk the yogurt, add grinded spinach and mix it well with yogurt. 4. Add cumin seeds tadka and salt, stir in with yogurt and spinach. 6. 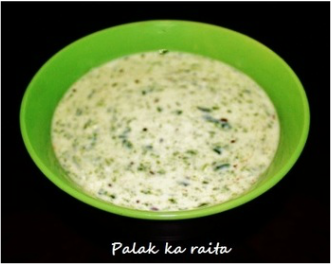 Keep raita in the refrigerator and serve it chill.